Will Vaping Damage Heart Health? Is Vaping Bad for Your Heart? People are turning to E-cigarettes in part because they don’t have tar, carbon monoxide or dangerous smoke like other traditional cigarettes do. But is vaping bad for heart? Health experts the world over, from the World Health Organization to the American Heart Association, are after regulations on e-cigarettes to be stricter because of possible lung and health risks. A study in 2015 that showed e-cigarettes can have a lifetime cancer risk that is 5-15 times worse than for smoking a pack of cigarettes a day. This is because of the formaldehyde in vapes. Long-term safety is still at question with these devices, although they have become very popular. Is vaping bad for your heart? Yes. There is a well-established link between stroke or heart disease and smoking. The fact is, using e-cigarettes for your nicotine fix won’t eliminate your heart risks. Nicotine is found in e-cigarettes and that has negative effects on the cardiovascular system. Nicotine narrows the heart’s arteries and arteries in the rest of the body. With time, this can cause serious harm that leads to heart failure, heart attacks and strokes. These e-cigarettes are the delivery system for nicotine, which is known to increase blood pressure and heart rate. This causes a risk for those who already have high blood pressure or irregular heartbeats. People with blockages to the coronary artery and those with congestive heart failure may have worse trouble with nicotine exposure. This can cause chest pain, or other symptoms of heart failure. Someone who has atrial fibrillation or arrhythmia, could have an episode caused by nicotine. Is vaping bad for your heart? Yes. But how? It is a mystery exactly how nicotine changes the function of the heart. It is possible that heart rate and blood pressure may rise from the sympathetic neural stimulation nicotine causes. There is some evidence suggesting nicotine disrupts the blood vessels lining. This can cause hardening of the arteries, or atherosclerotic plaques. 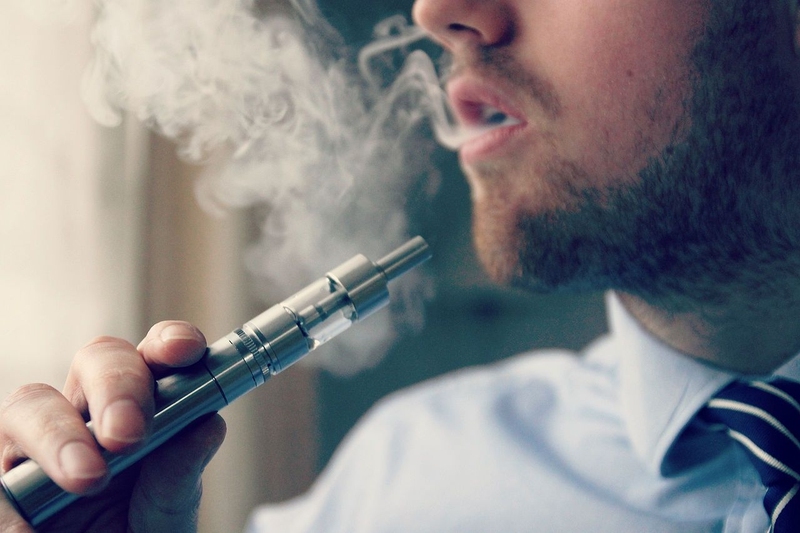 A study showed some lung diseases having a direct link to e-cigs. They found that e-cigs significantly increase neutrophils, which add to inflammatory lung diseases like cystic fibrosis and COPD. Harvard Health Publishing also reported that diacetyl, a dangerous chemical compound, known to be linked to bronchiolitis, is found in e-cigs. The National Institutes of Health show bronchiolitis is from inflamed and damaged bronchioles, the tiniest airways in the lungs. Is vaping bad for your heart? Yes. It is also additive. There is a randomized study showing that e-cigs were most helpful with those quitting common cigarettes by helping with nicotine withdrawal. But there are other studies that show e-cigarette users don’t quit any more frequently than those who don’t vape to quit. This is because of the amount of nicotine still present in vapes and e-cigs. The American Lung Association performed a study in 2014 that showed e-cigarettes have a wide range of ingredients and a variety of levels of nicotine. The more nicotine someone uses, the bigger risk of addiction, according to the ALA. It is reported that using vapes and e-cigs can lead to an increase in blood pressure and raised heart rate, putting your health at risk. Another study showed that nicotine found in e-cigs can cause arteries to become stiffened. It is important to note that arterial stiffness is highly associated with risk of stroke or heart attack. Effects can be noticed just a half an hour after the vape or e-cig is used. There was a study in 2013 that showed e-cigarettes aren’t emission-free and their pollutants can be a health concern. The study also showed there were ultra-fine particles from vapor that can find their way into the lung of non-smokers. There are many methods you can try for quitting, whether cigarettes or vaping. Addiction therapists recommend cognitive behavioral therapy or CBT as well as hypnotherapy for success. For some, this therapy is out of the question. For those, brake any associations with e-cigs or traditional cigarettes, such as talking on the phone, driving, or eating. If you smoke while on the phone, do something else. Try pacing around. If you smoke while drinking your coffee or alcohol, don’t light up at the start, wait until your drink is nearly finished and continue dragging it out. You can do this with time associations. If you have one first thing in the morning, start delaying until after breakfast. Finally, if you must, start avoiding things that trigger you to want to light up. Flush your system with water to help get rid of the nicotine and other toxins. Ginseng powder can help curb cravings. Ginger tea can help with the nausea of nicotine withdrawal. Try snacking on raw veggies and chew gum instead of smoking. Try hard candies or liquorice sticks to curb cravings. Fava beans have levodopa which has mood-boosting abilities. Add cayenne pepper or chili to your food and even your water. The heat helps your body release endorphins which enhance your mood.